Something exciting is happening in Riverdale! 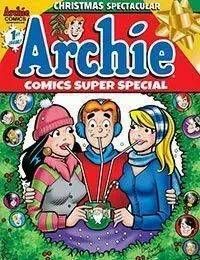 Get in on the ground floor with the spectacular, quarterly Archie Comics Super Special Magazine! This Magazine features over 120 pages of classic Archie stories, fashion, puzzles, and more! Every quarter brings a specially-themed collection that will have you excited for the next edition. Dont miss out on creator spotlights, the latest Archie news and much, much more in this jam-packed magazine!